lmost everyone has a "junk" drawer in their kitchen. So that's what I'll tackle today and tomorrow, the information applies to any type of drawer, whether it's full of clothes, kitchen gadgets or miscellaneous tidbits. Let's be realistic about this photo, do you think they found an organizer that happened to have all the perfect spots for their junk drawer? No, they found the perfect sized stuff for the container, that's why I wouldn't advocate rushing out and buying something like this. Everyone's stuff is different, find out what you need first, then buy accordingly. Our junk drawers are not really full of junk, but all the miscellaneous bits and pieces that you are forever needing close at hand. Junk has such a negative connotation, surely there are better names for it. 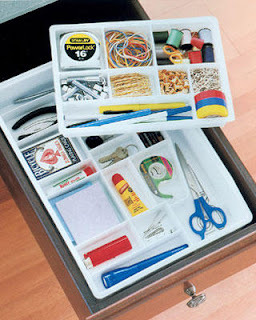 Regardless of what you call it, it seems to be the drawer that is least likely to stay organized. If you are like me, you are in and out of it at least 5 times a day, now multiply that by the number of people in your family (tots and babies excluded of course). The drawer gets a lot of use and things are constantly going in and coming out. The only way to keep it neat is to have a place for everything, otherwise everything just gets dropped in and you are forever searching for tidbits. Have you ever heard yourself saying to a family member: "I know it's in there, look harder." I had an e-mail regarding my vanity drawer asking me if it really looks like that or did I straighten it for the photo. I didn't straighten it, it really does always look like that. However, my junk drawer while mostly organized would definitely need a straightening for a photo, the last straightening was done about 2 years ago. I actually don't think it's that bad for 2 years. Determine what's currently in the drawer and what needs to be in the drawer that might be elsewhere currently. In some cases, what is it? Do I really use or need it? Is there a better place in the house for it? Gather up storage containers that you can use, remember I'm not advocating buying anything yet! Live with it for a while, rearrange and adjust as you add additional items or move things to other homes. This isn't possible if you run out and buy a drawer organizer right away. Given what I have above I need a lot of small boxes, a couple long narrow boxes and a big empty space for the phone book, papers (if they even need to stay) and coupon book. I currently use an old flatware tray in that drawer, the previous owners left theirs so I moved it over there. But I'll try to organize it with other things from around the house, the way I would if I was starting from scratch. If you want to organize your junk drawer with me, take about 5 minutes today and gather the things that belong in your junk drawer that aren't there currently. Also, measure the depth, width and length of your drawer tonight, so you'll can find or make containers that fit your drawer. I'll include a Mr. Linky tomorrow so we can share our before and after's. I'd like to know what else you store in your junk drawer, so tomorrow when I lay it all out and put it away, I'll be sure to have a better representation of what most families would have. Especially speak up if you have small kids, I'm sure I'm missing the little things that would come with having kids in the house 24/7. I love all of your ideas for getting & staying (my biggest bugaboo) organized. Thanks for all of the ideas. Liz: Glad you like it, I could spend hours playing there! Sue: Glad to oblige! It's nice getting the junk drawer reorganized, I didn't realize how messy it had gotten. It really needed it. It's easier to stay organized than to get there in the first place, but it does require constant straightening and attention. I keep wishing I could pull a Mary Poppins and snap my house clean. Thank you so much for commenting. I love every single one! If a photo is not credited properly, please let me know and I'll correct it immediately! Copyright © 2004-2012 Candy Hearts and Paper Flowers. Powered by Blogger.